Have you been wondering if your furnace is working? Whether you’re unsure because it’s so warm out or if it’s the middle of the winter and you have to keep your system on 90 to stay warm, Cool Masters Heating and Air has you covered. 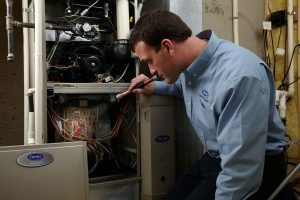 We will check your unit for any malfunctions and provide the needed tune-up or repairs. Prevention is the name of the game when it comes to HVAC maintenance and furnace longevity. Our staff of fully trained and licensed professionals are experts on furnace repair in Johns Creek, Georgia. There is an abundance of benefits to having your furnace checked regularly. You may have thought toward the end of last winter, “That furnace is acting funny, I’ll get it checked over the summer. I’ve got plenty of time.” But then the spring and summer pass, colder weather arrives and you are sitting there with little or no heat. Let us help you avoid the higher heating bills and poor efficiency by scheduling your Johns Creek HVAC tune-up today. You could possibly be just a small fix from preventing your entire system being replaced. You’ll be so happy that you had your furnace looked at preemptively. Instead of dropping a few paychecks on a new furnace, you can take the time to get it inspected now and our certified technicians can end up saving you your hard-earned cash. We offer free estimates on replacements and have a satisfaction guarantee. If your system is completely beyond repair, we offer competitive pricing on our HVAC installation. Cool Masters HVAC will help you choose the right model for your home, not the most expensive. We encourage you to buy what you need, not what we want. Our team understands that your time and money are valuable and they respect and honor our commitment to you and your family. No matter your HVAC need in Johns Creek, GA. Whether it’s a clunking furnace or a screaming AC unit, we’ve got all of your HVAC and energy saving needs covered. Our friendly and knowledgeable staff can answer any questions you may have and will be happy to give you some pointers on saving energy. You can just click the button on the right side of this page to schedule an appointment today.